Awesome outfit, love the pop of red. This is super cool! Love your heels~! Absolutely love this all black look with the pops of red!! Gorgeous. So amazing. Black and red is always a great combination! wonderful your look, i love it! Beautiful look! the leather pieces are classic yet edgy. love the look, especially these pants and the heels! This sweater is amazing! I think this might be my favorite look of yours yet! Oh yes, definitely a cool look. Love the sweater with those leather pants. Such an amazing look on you. Oh I fall in love with your shoes! Great look! i love the heels. so amazing! SO gorgeous! That sweater is ridiculously cool! So beautiful! Love the shoes!! Beautiful look and such amazing shoes ! I'm not sure if I love the sweater or the pants more! Super cute look. I love this outfit you look amazing! Super cool pants! Love your red shoes and your sunglasses! Lovely post! OBSESSED with those red heels girlie! I agree with you! 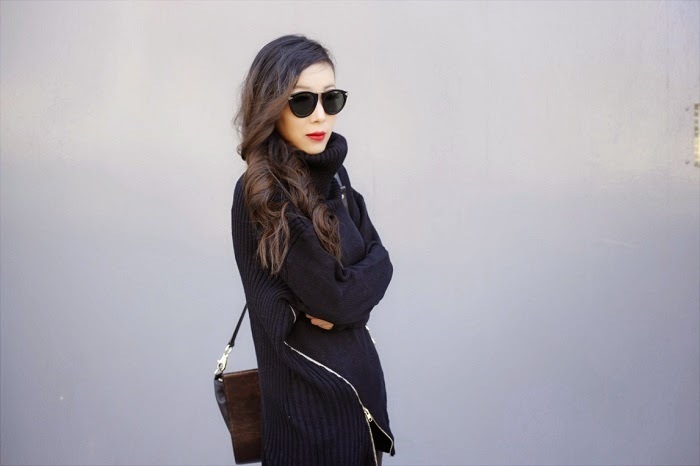 All black looks + a pop of color is an automatic win in my book too! Those heels are gorgeous!! The combination looks so stunning on you x.